In the past, I always saw hunger as a physiological need. It was simple: hunger signals meant that I needed food.1 But there were times when my desire for food wasn’t accompanied by physical hunger. Determining that my hunger came from an emotional source rather than a physical source was not too difficult, but coming to terms with emotional eating and that it could somehow even apply to me was complicated. I have this desire to be strong and tough, so eating emotionally seemed too touchy-feely for me. Once I accepted the fact that I did eat emotionally, I thought to myself “Now what?” and began a quest of figuring out how to deal with this new challenge. I am someone who does not want to feel my feelings. And I know I’m not the only one who does this. Uncomfortable feelings are hard to deal with. That’s why they’re called “uncomfortable”. It became so routine for me to ignore my feelings that identifying my feelings and coping with them without food was completely foreign to me at first. But I knew that using food as a coping strategy meant that there was a need somewhere in my life that wasn’t being met. Food would only make me feel better temporarily. At the end of the day, the need would still be there. In order to feel better emotionally, I had to actually address the underlying need. Is the hunger physical or emotional? Differentiating between the two can be tough, but the first step is to identify that I have an emotional need. I take a deep breath and look for my typical hunger cues. If I feel them, then I eat. If not, then something is going on emotionally. What am I feeling? Sometimes I have one strong emotion and sometimes I have mixed emotions. Identifying what I’m feeling is the next step in figuring out how to cope. The list of possible emotions goes well beyond what I have here, but these are the ones that I feel most often. What do I need right now? Then I try to figure out what I actually need since I know it’s not food. Do I need to vent? Do I need to distract myself? How do I get that need met? Now this is the tricky part. I need to find another way to cope with my feelings other than turning to food. This was a bit of trial-and-error at first, but it helped me figure out what coping skills worked best for me. I can blog about what’s on my mind. I can find some long forgotten task to do around the house. I can call up a friend and catch up. By going through these steps in my head, I really am performing self-care. Whether I complete all of these steps or just decide to sit with the feeling until it subsides, I am putting my needs first. Acknowledging my feelings and addressing them without food sounds great and all, but there were times when I couldn’t find another coping skill at that moment. When this happened, I gave myself permission to eat. I did it mindfully. I was in the moment and aware. The last thing I wanted was to mindlessly down half a bag of nuts3 and then be consumed by guilt. Giving myself permission to eat with a side of self-compassion made a world of difference. 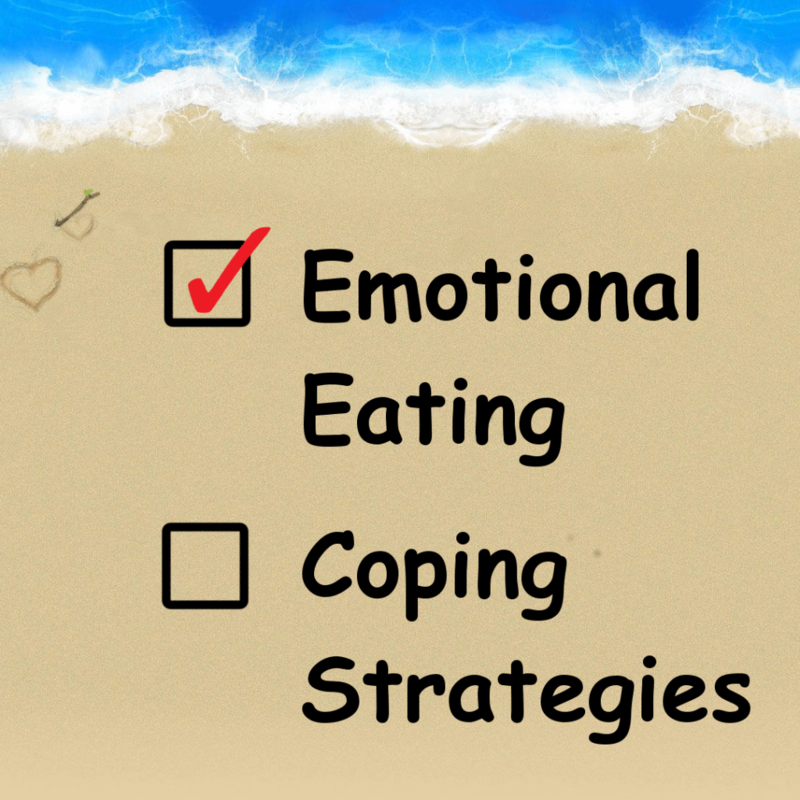 Working through emotional eating was not easy stuff, but I felt it was important to tackle for the sake of my mental health. Even if there were times when I was unable to come up with or try any coping strategies, at least there was an awareness which wasn’t there before. Now whenever I think about using food to push down my feelings, I always ask myself why. There is a reason for it. What is going on? Am I overwhelmed? Stressed? Bored? Sometimes I don’t know why, but I’ve grown to where I am now able to at least pause and process what I’m feeling and, more often than not, address my need without food. What other ways can you cope with your feelings other than turning to food? Please share in the comment section below. 1Yes, I often ignored my hunger signals in the name of dieting, but I knew they were there!